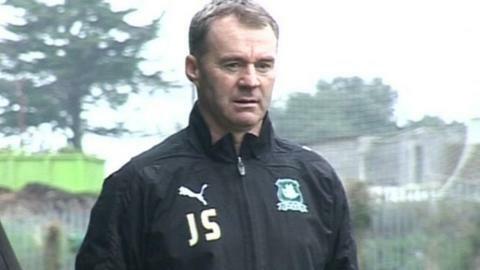 Plymouth Argyle manager John Sheridan says he was "frustrated" by his side's in League Two. The result leaves the Pilgrims out of the relegation places on goal difference having played two more games than the teams below them. "I was very frustrated with the way we played in the first half there was no urgency," he told BBC Radio Devon. "We didn't really create anything so I was really disappointed with the first half." But the Argyle boss, who took charge of just his second game since praised the impact teenage substitute Luke Young had on the game. The 19-year-old midfielder came on with 25 minutes to go and impressed the manager. "When I brought Youngy on he changed the game, I thought he was the best player on the pitch. "He looked confident in himself and he wanted to move the ball quickly and create things. "He got us back into the game and I thought second half we had a go and had one or two opportunities." The result was Argyle's first clean sheet since the but Sheridan says the player's morale must improve if they are to better their current run of one win in their last eight games. "It's going to be hard to get confidence into the players," he added. "We're trying our best and we want them to believe that we can win games, but because of where we are everyone's on edge. "I thought we lacked a bit of confidence and we've got to get it back into the players as soon as possible."